The federal government said this week that it will not consider a suggestion to euthanize the animals or sell them to slaughter. 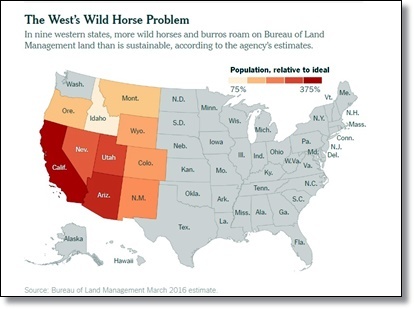 The pronouncement, issued by the Bureau of Land Management, followed a public outcry over an advisory board’s recommendation on Friday that the agency kill or sell all of the 45,000 horses and donkeys in its custody that cannot be adopted. An online petition has collected more than 118,000 signatures so far. But a spokesman for the bureau made clear in an interview that it had no plans to act on the advice. 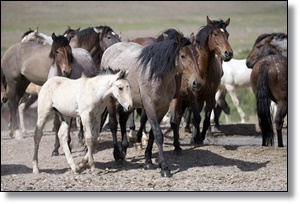 The bureau will reinforce its contention at the next meeting of the group that made the recommendation, the National Wild Horse and Burro Advisory Board. The recommendation was adopted by seven of its members, with one dissenting and another absent. It meets again in the spring. The advice, however, puts into focus what some have described as a crisis for the program: The bureau takes in more and more animals as the population in the wild swells, using money that could be spent on dealing with population growth in the first place. The federal agency houses more than 45,000 horses and burros in corrals, pastures or sanctuaries at a cost of more than $49 million annually. The imbalance is most severe in California, where the current population is 3.8 times the sustainable level, according to the bureau’s estimates. The agency takes more in each year, but it can’t keep up with explosive growth: The wild population expanded by 15 percent last year and 18 percent the year before. While the agency adopts out thousands of animals each year and administers birth control to hundreds more, neither of these methods makes for a viable long-term solution to the population problem, Mr. Gorey said. The best hope is to improve birth control. “What we need is a deus ex machina; we need a longer-lasting fertility-control agent and right now that’s not to be seen,” Mr. Gorey said. Current methods last about a year. In the meantime, he said, the agency will just have to do the best it can to keep the booming population down. 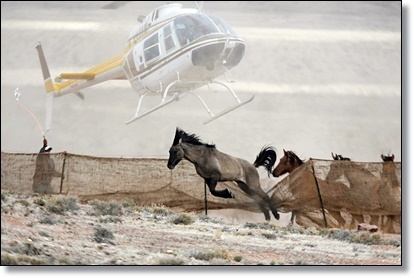 The Bureau of Land Management used a helicopter to trap wild horses in Utah in 2015, though several escaped. It is costly to manage the animals, some critics say. Credit Jim Urquhart/Reuters.